E-FX market fragmentation will remain as exchanges take greater interest in OTC FX and banks relinquish their market-making role. Boston, May 20, 2015 – The FX marketplace will continue to evolve and become recognized as a stand-alone asset class, yet it remains both fragmented and dynamic. Since 2013, volume at Bloomberg’s FXGO business and FXall has sharply risen. Meanwhile, a number of emerging players managed to grow their books of business despite a soft spot FX market. What do the volume, features, and initiatives of both established and emerging e-FX players reveal about this market, and what types of change might be ahead for these venues? This research, originating from Aite Group’s proprietary knowledge and surveys of 18 profiled participants in the e-FX marketplace, describes these firms’ offerings and offers a comparative assessment of the same. The venues are 360T, Bloomberg, CME Group, Currenex, EBS, FastMatch, FXall, FX Connect, FXSpotStream, Hotspot FX, Integral, LMAX Exchange, Molten Markets, Thomson Reuters, Citi Margin FX Trading, FXCM Pro, Gain GTX, and Saxo Bank. This 61-page Impact Report contains 14 figures and seven tables. Clients of Aite Group’s Institutional Securities & Investments or Wealth Management services can download this report. 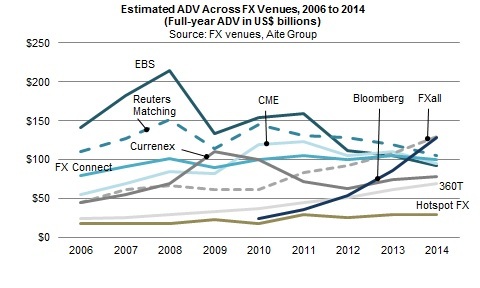 Buy-Side FX Outlook 2015: Measuring Up to Best Execution?